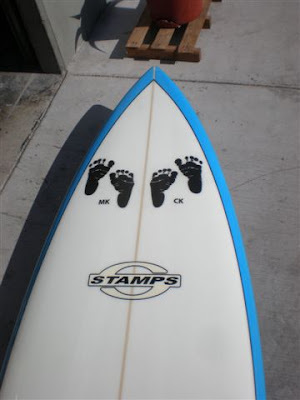 Stand Up Paddle Surfing: Kraig Surplus' New 9'6 Stamps Viking: Let the ripping begin! 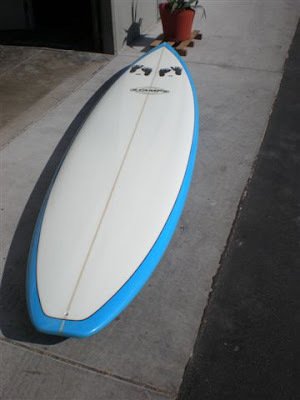 Kraig Surplus' New 9'6 Stamps Viking: Let the ripping begin! The foot prints of the soon-to-be, K-surplus grom patrol. The Viking's the one to go to if you're looking for a "do-able" high-perf. stand up in the sub 10' range. You'd be surprised at how stable these things are and yet there's no performance loss- your rip quotient will definitely increase. Once again, I see- I want. Good thing this one's going to be locally owned- I may get a chance to give her a spin. Is it me or does the squash tail change the outline a little bit- is there a bit of a straighter line from the hip region down to the corners of the tail? Or am I just seeing things? Any way you look at it, this is a hot board. 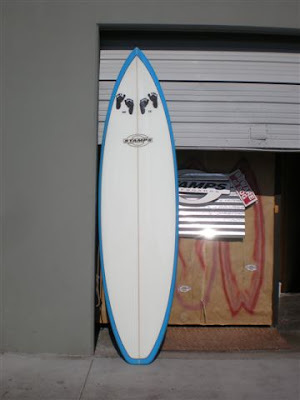 Made like a surfboard, feels like a surfboard... Kraig's going to be blown away! Want to learn how to stand up paddle surf? 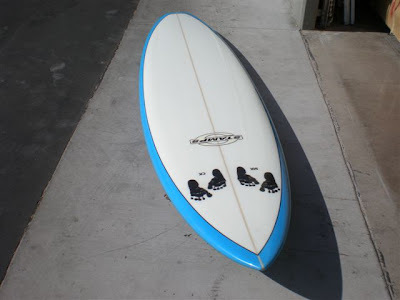 Give me a call at 619.213.6622 or email John@paddlesurf.net and I'll get you started today! Learn to paddle surf right here in sunny San Diego. We've put scores of people on stand up boards- let's get out and paddle today. For more information about our lessons click here be sure to check out the testimonial's from stoked clients. FULL REPORT BY THIS WEEKEND. k waves been good at l.j.shores hitting at 10 am take the viking for a ride place holds the wind.captneg9. Hey Neg9- Heard it was good- Kraig was killing it last night on his new board- which looks great!